Summary QCA-based AC1750 class router with Gigabit ports, USB 2.0 storage sharing and VPN servers. Several weeks ago, we reviewed the EnGenius ESR1200. We concluded that the ESR1200, priced slightly higher than competing AC1200 class routers, had little to recommend it, other than its built-in IPSec, L2TP over IPSec, L2TP and PPTP VPN servers. In this review, we’ll take a look at the top-of-line AC1750 class EnGenius ESR1750. One of the most interesting discoveries about the ESR1200 was that it uses the identical hardware found in the ESR1750. 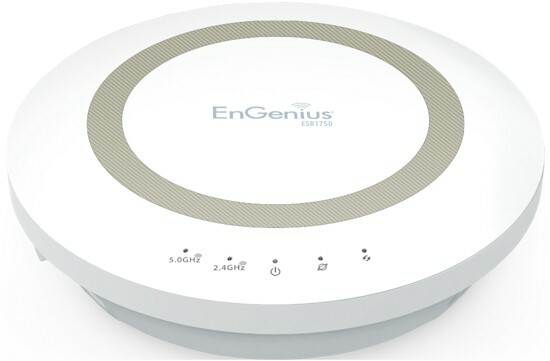 EnGenius just locked the link rates on the ESR1200 to make it operate as an AC1200 class router. Both routers share the same FCC ID (A8JESR900), so you know that the internal components have to be the same. Not surprisingly, the ESR1750 callout diagram below is virtually identical to the one for the ESR1200. The only difference is the model number printed in the center. One thing to note: If you like LED link and activity indicators, you’re going to be disappointed. There are no link or activity indicators for any of the wired ports. In his ESR1200 review, Scott did a great job of exploring all of the features and internal components, so refer back to his review for that content. For the sake of completeness, I’ll reiterate just a few items from his review. But for the most part, this review will focus on the performance of the ESR1750. As expected, the ESR1750 outperformed the ESR1200, but its performance placed it at the bottom of the Router Ranker for AC1750 class routers. We often use the FCC certification documents for our inside circuit board photos. It turns out, that was a bad idea because the actual products are very different from the product shown in the FCC ID internal photos. The image below is a photo of the actual ESR1750 board from the reviewed sample. The 5 GHz radio is on a mini PCIe board instead of integrated directly into the main board as shown in the FCC filing. The switch chip is different than originally identified and so is the 5 GHz radio. At least the QCA9558 dual-band, 3-stream 802.11n system-on-chip was properly identified. Below is an updated summary of key components. I've included the ESR1200 to show the differences.